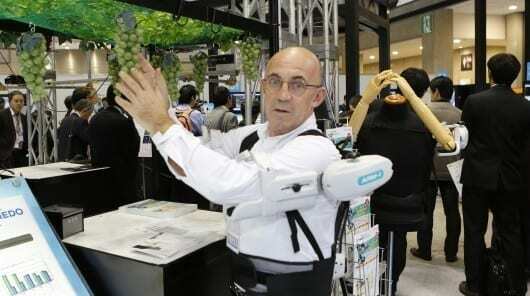 Though not yet at market, the ARM-1 is a finished product that is expected to sell in the range of JPY 110,000 to 120,000 (US$1,100 to $1,200) as a productivity aid for fruit picking and any activity where a worker’s arms are held above their shoulders for extended periods. March 25, 2019 - Low-cost ankle exoskeleton boosts leg strength discretely The EngineerEngineers at Vanderbilt University have devised a low-cost ankle exoskeleton that can be worn under clothing, enhancing lower leg strength discretely. March 25, 2019 - Low-Profile Assistive Ankle Exoskeleton Can Be Worn Under Clothes | MedgadgetResearchers at Vanderbilt University have developed a lightweight and inexpensive ankle exoskeleton to assist those with impaired lower leg muscles or. October 17, 2018 - A Device That Makes Running Faster and Easier The New York TimesMen reduced the energy cost of their running by about 8 percent when they wore the new contraption. April 6, 2015 - An unpowered exoskeleton decreases the energy required for walking Ars TechnicaWith no energetic input, a boot-like device increases walking efficiency. October 14, 2014 - The Fortis exoskeleton let you lift heavy tools indefinitely - and it's unpowered! ExtremeTechThere are many different takes on what a human exoskeleton could look like, and a few have even been put into *service* to greatly augment the human body. August 27, 2018 - Are Exoskeletons About to Go Mainstream? Singularity HubIf exoskeletons are going to make life easier for humans, they need to be unobtrusive, lightweight, and adaptable to various body sizes and shapes. December 4, 2018 - The mechanical exoskeleton taking the load in modern auto factories TechRadarNot all roles in factories can be automated – some still require the skills and adaptability of a human – but such jobs can put a lot of strain on workers' bodies. December 8, 2015 - Knee pain? Achy joints? Passive bionic devices are coming ZDNetNo motors, no recharging. Unpowered wearables may soon improve your game and lower your pain. April 30, 2015 - Four Videos of Four Passive Exoskeletons Exoskeleton ReportPassive exoskeletons have become a bit of a hot topic over the last few weeks. Here are four videos of four different exoskeletons in the headlines. May 2, 2017 - The market for robot exoskeletons is finally here, and they’re nothing like the suits from Ironman or Aliens. QuartzHollywood set a high bar for exoskeleton suits. Technology imagined in Iron Man, Aliens, and Edge of Tomorrow all endow humans with superhuman abilities. August 7, 2018 - Ford makes EksoVest exoskeletons available to employees worldwide after successful US trials New AtlasAfter a successful trial in two US plants, Ford is now offering a wearable upper-body exoskeleton to employees in 15 of its plants all across the globe. September 7, 2018 - Lockheed Martin Research Results in Advanced Industrial Exoskeleton ThomasNet NewsThe FORTIS exoskeleton is unpowered and lightweight, but makes up to 36 pounds feel essentially weightless. August 30, 2018 - Ford Equips Assembly Workers with Exoskeletons ENGINEERING.comWearable upper-body exoskeletons are available to workers to support their arms when performing overhead tasks. October 18, 2018 - New device for boosting running efficiency shows promising results Canadian Running MagazineDevice that boosts running efficiency by 8% or more could make running easier for seniors, those with health issues. December 9, 2015 - Greg Sawicki on Successfully Reducing Walking Metabolic Cost Exoskeleton ReportThe Passive Ankle Exoskeleton for reducing the metabolic cost of walking is the single greatest exoskeleton development for the 2015 calendar year! September 27, 2018 - Harvard refines military exoskeleton technology TEVO - Textile EvolutionCAMBRIDGE – Researchers at Harvard University's Wyss Institute for Biologically Inspired Engineering and the Harvard John A. Paulson School of. November 10, 2017 - Ford Assembly Line Workers Try Out Exoskeleton Tech to Boost Performance IEEE SpectrumThe upper body EksoVest exoskeleton from Ekso Bionics helps Ford workers with overhead tasks. September 19, 2018 - Soft Exosuit Helps Soldiers and Rescue Workers Traverse Difficult Terrain ENGINEERING.comFully wearable soft exosuit saves energy when walking and provides mobility to the mobility-impaired. April 17, 2015 - This cheap, unpowered exoskeleton could improve lives the world over TechlyWhen we hear the word 'exoskeleton', we tend to think of high-tech, high-powered robot fittings that would make us as strong as Iron Man, but only if we're. February 11, 2016 - No motors required: A passive bionic device for consumers is on its way ZDNetThe technology, which is already used by industrial workers, promises to make us faster, stronger, and pain-free. August 2, 2017 - UPRISE Tactical Exoskeleton Officially Announced by Mawashi Science & Technology - The Fire Arm BlogCanadian technology company Mawashi has formally introduced their flagship product: A passive exoskeleton designed to help the soldier carry his heavy load. April 23, 2018 - Exoskeletons May Do More Harm Than Good | MedgadgetThe promise of exoskeletons is to make manual labor easier by providing extra strength to the arms, and hopefully alleviating injuries and overall impact. August 26, 2014 - lockheed martin fortis exoskeletons tested for US navy military SEALs Designboomthe unpowered, lightweight 'fortis exoskeleton' by lockheed martin, is being tested by the U.S navy in order to evaluate the benefits for SEAL usage. December 2, 2013 - Know Your Mechanical Exoskeletons Popular MechanicsWearable exoskeletons will revolutionize manufacturing, healthcare, and the military. Say hello to the prototypes and new models that will make it happen. March 13, 2016 - Robotic exoskeleton for paraplegics approved for market CNETA robotic exosuit that will help paraplegics stand and walk is the second to be approved for clinical and personal use by the FDA. January 4, 2016 - Iron Man vs Invisible Chairs: Fighting for the Future of Robot Exoskeletons InverseHuman bodies are frail machines contrived of snapping sinew and breakable bones. We know this. Hell, we're self-conscious about it. Since Dr. Edward E.
September 8, 2014 - Gimbals Add Flexibility to Industrial Exoskeleton Electronic DesignThe U.S. Navy plans to evaluate and test Lockheed Martin's FORTIS industrial exoskeletons, which help minimize fatigue in heavy-duty operations. August 14, 2015 - Medical Exoskeletons Become Practical Electronic DesignExoskeletons can be used for medical and other applications. Lower body bionics can even help those with lower extremity weakness walk. August 20, 2014 - Lockheed Martin's 'Fortis' Exoskeleton in Action Daily MailLockheed Martin is developing next-generation, unpowered, lightweight exoskeletons that will provide the user strength, endurance and flexibility. January 13, 2015 - Exosuits: Not Just a Day at the Beach War on the RocksIn the 2014 movie Edge of Tomorrow Tom Cruise's character has a bad day. And like Bill Murray in Groundhog's Day, he has to live it over and over again. June 30, 2015 - Ekso Bionics: Strong Buy For 150-350% Upside On Three H2:15 Catalysts That Will Step-Change Valuation Seeking AlphaEKSO is down 40% since publication of a short report. Competitive threat in medical/industrial markets is overstated; the industrial market is EKSO's key value.